New York, NY (May 29, 2018) – Valiant is proud to announce that VALIANT UNIVERSE: THE DECKBUILDING GAME, created in collaboration with Catalyst Game Labs, has been selected as a featured game for this year’s Unrivaled, the world’s largest tabletop game tournament! VALIANT UNIVERSE: THE DECKBUILDING GAME joins 15 other tabletop games as part of 2018’s Unrivaled Tournament, including Kingdomino by Blue Orange Games, Onitama by Arcane Wonders, Evolution by North Star Games, and Exploding Kittens by The Oatmeal. 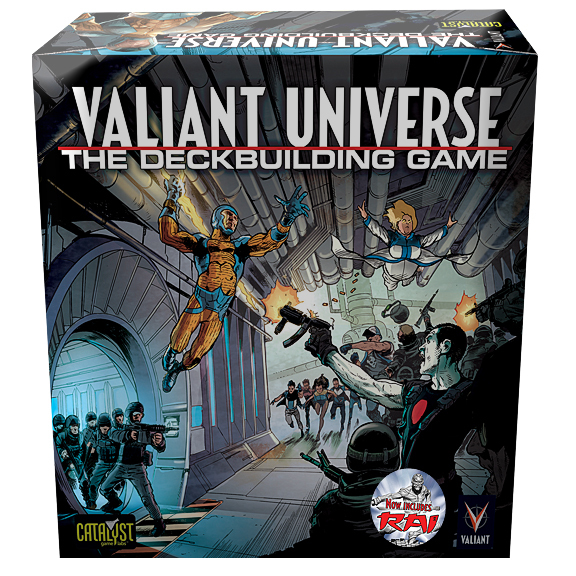 VALIANT UNIVERSE: THE DECKBUILDING GAME is available to play now at satellite qualifiers and regional tournaments in participating local game stores and game conventions across North America all summer, culminating in a Grand Finale that will be broadcast live from Las Vegas this late Fall. After a successful inaugural year in 2017, this year’s Unrivaled prize pool is up to $300,000, with top players eligible to win $10,000 each! Taken from the pages of Valiant’s critically acclaimed line of comics, in VALIANT UNIVERSE: THE DECKBUILDING GAME, players go up against Project Rising Spirit to infiltrate and seize their massive, hidden research installation located under Alcatraz Federal Penitentiary. Codenamed “the Facility,” the structure uses unknown energies to morph and transform itself at will to keep horrid villains, dangerous creatures, alien entities, and top-secret research projects trapped within. Rumors of the Facility’s existence and its most prized possessions have leaked, and the Valiant Universe’s most powerful organizations – The Harbinger Foundation, the Renegades, G.A.T.E., and more – are taking an interest. 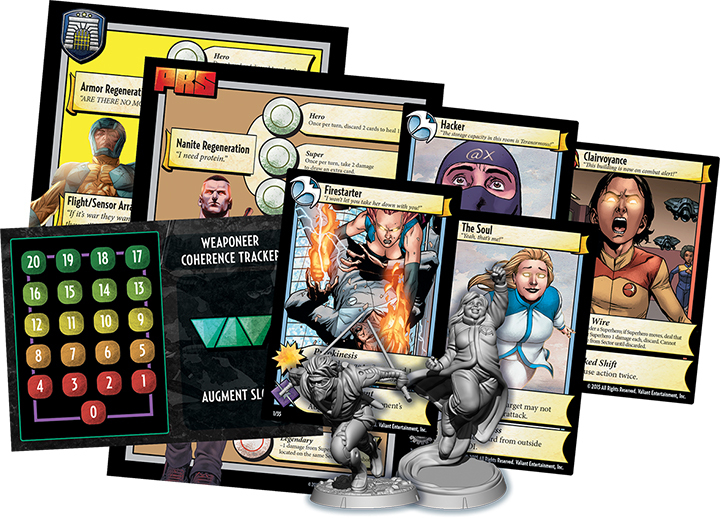 Players purchase cards to craft a unique deck, then battle their way through the ever-changing Facility grid that moves during play, maneuvering their superhero miniatures to battle it out with other heroes for ultimate control! For more information about the game and how to order a copy, visit catalystgamelabs.com. Unrivaled Tournament regional events bring employees and customers from local game stores together at parties held at GameWorks or comparable venues around the country to compete for prizes and a chance to win a seat at the four-day Grand Finale in Las Vegas. 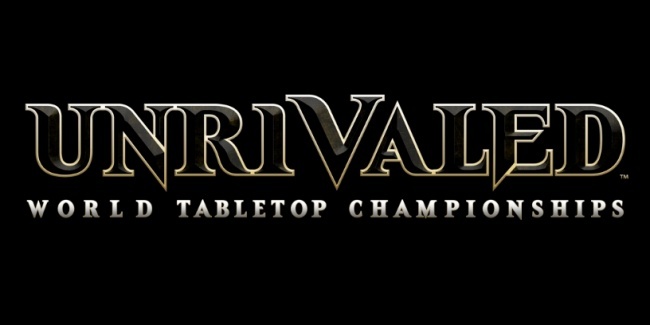 The Unrivaled Road Crew also recently set off in May to tour the country, appearing at local stores and gaming conventions, such as Gen Con and Origins, and offering additional opportunities for players to secure an entry in the Finale. Awards will also be earned by the stores represented by the players, so they can join them at the Finale. All game stores registering to become a sanctioned Unrivaled venue for 2018 will be invited to the regional events, space permitting. The first Regional event was held in Salt Lake City, Utah at Oasis Games on May 19th. For a complete schedule and information on how to register as a player or sponsoring store, visit unrivaled.com. Valiant was recently acquired by DMG Entertainment, a Los Angeles-based leader in global entertainment with diverse holdings and operations. Under the DMG umbrella, Valiant’s characters continue to be forged and brought to life in publishing, licensing, film, games, and beyond. Valiant and DMG most recently announced a multi-picture deal to bring BLOODSHOT and HARBINGER to the big screen as feature films. For more information about Valiant and its publishing line of comics, visit valiantentertainment.com. Best of luck to all the Unrivaled Tournament participants out there!